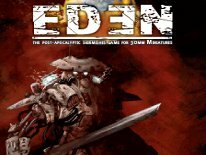 This time out we're here to take a look at some of the Kolony Feral pieces from Pig Iron Productions. These are some really unique, very post apocalyptic-looking pieces. These remind me a lot of the nomadic extras you'd find in the background of the 80s sci-fi B-movies depicting life after the bomb. They're like a nomadic militia. 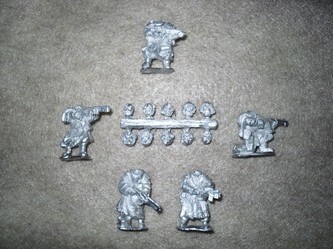 First up is the Kolony Feral Squad Pack, or part number KL.8 via the Pig Iron Productions website. This is a 5 piece set. What I noticed off the bat was, that every figure in this set has a unique pose. No two are the same. This is earns big points with me. 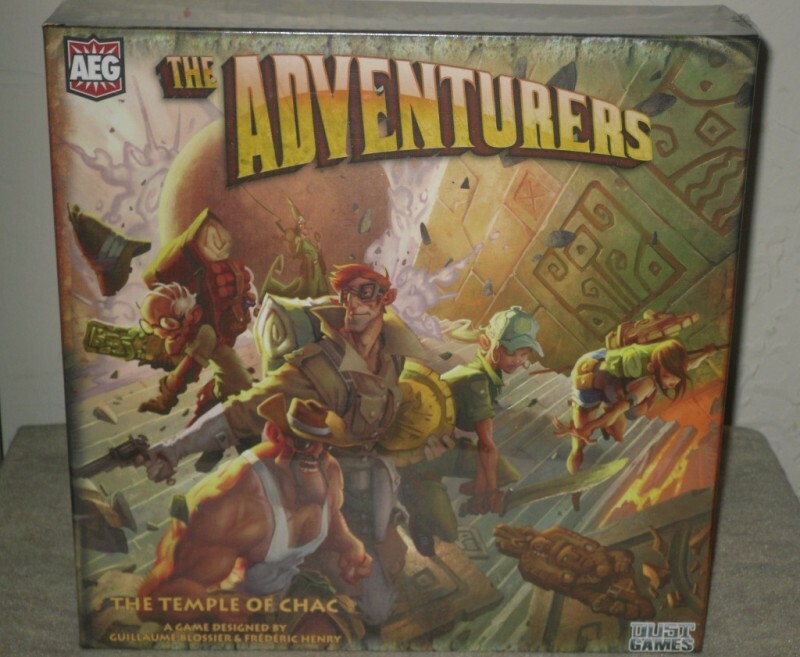 Four of the sculpts are standing, with one kneeling. The poses are somewhat dramatic, but not over the top. You can tell they're all on the move, or getting ready to take a shot at someone. They're all wearing tattered clothes, with what appear to be hooded poncho-type garments over top of it all. These are all single piece castings, minus a head. Mold lines and clean up was also minimal, but there was one nasty mold line on the arm of the kneeling fella that got under my skin a bit. I also think the weapons are a nice touch. These look like believable rifles, because they're not over the top, but they look very 40k-ish which is the best way to describe them. 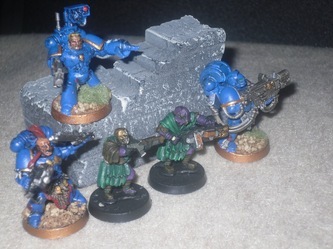 Two of the figures have what appear to be smaller, maybe Carbine versions of the rifles. The weapons have a solid military look, and feel about them, but they're not so big or out of proportion that they look comic-book like, or stupid either. Quite frankly, they look like a variation of GW's own bolter rifle. 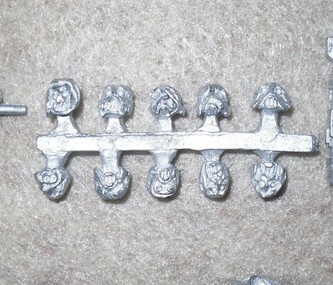 Also included is a head sprue, featuring 10 totally unique heads. This is also like a lot. Variety is always a good thing. The nice thing is this set doesn't cost anymore than any other 5-figure set from them, and it includes 5 spare heads. The means to pick and choose which heads you want to use is always a big plus. Although once again, I do have to report, that these, like all of their other sets, include no bases. There is a small patch of metal underneath their feet, but that's about it, and it doesn't help them to stand very well. So you'll need to buy bases if you want to set these guys up properly. Personally, I'd rather see them include some generic solid 25mm bases, and charge $2 more per set, than to include none at all. Next up are the Kolony Feral Specialists, or part number KL.9. This is a 4-piece set. This is a trend with them, and I don't quite understand why the heavy wep, or Specialist sets as they call them include one less figure. 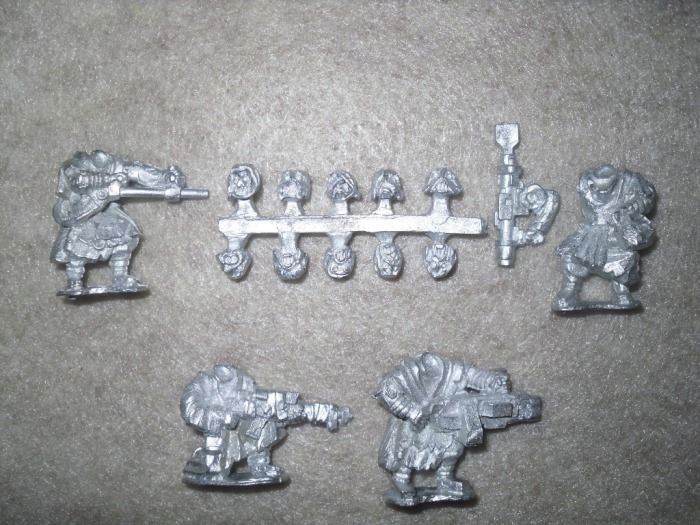 The heavy weapons aren't much bigger than the weapons included with the 5-piece sets, and overall it doesn't even look like there's that much more metal needed to make these casts. If I didn't know any better, I'd say there's less metal since it's one figure less too. For the most part cleanup wasn't a big deal, as there were a few minor lines here and there, and very little flash to clean up overall. Nonetheless, these are equally as impressive looking pieces as the Kolony Feral Squad pieces, the only difference is that these fellas come packing a little more firepower. All four pieces are unique sculpts, with three standing and one kneeling. Three of the four are single piece molds, minus the heads, and the 3rd standing piece has a separate arm with missile launcher to glue on, in addition to the separate head. One of the standing pieces is wielding what appear to be a flame thrower, another is handling what looks like a Heavy Machinegun and the kneeling fella I'd have to say he has a sniper rifle by the looks of it. I guess you could say the one rifle is a Lascannon, Plasma Rifle or Melta-Gun as well, since it really doesn't look like anything other than a rather large sniper rifle. Personally, I really like that rifle the best too. The flamer looks primitive, or maybe simple is the word I'm looking for, and the same goes for the bazooka/missile launcher. The two weapons that stand out are definitely the heavy bolter and sniper rifle in this set. 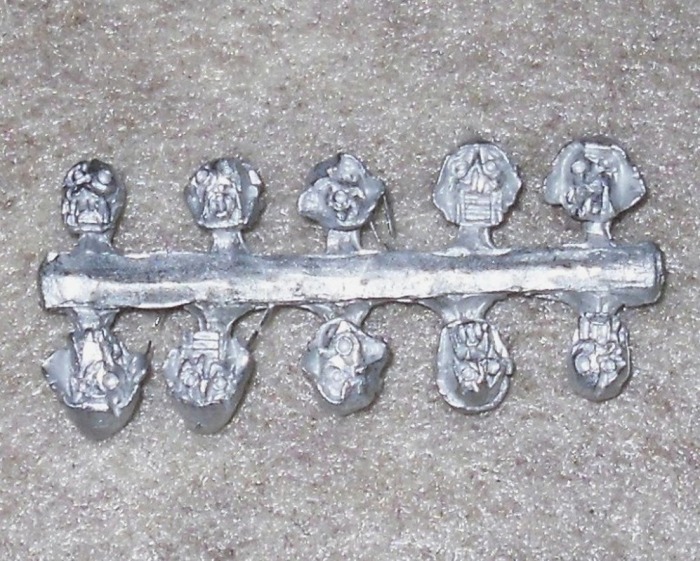 Like the other set, this set too also includes a bonus 10-head sprue to select the heads from, leaving you six extra leftover heads to use for modding projects. 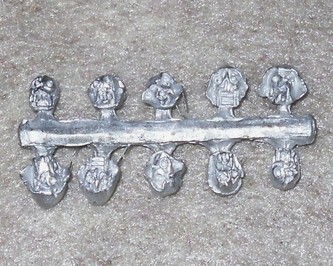 This looks to be a completely different assortment of 10-heads than the sprue included with the Kolony Feral Squad too. Again, aside from a small patch of metal from under their feet, there are no bases included. 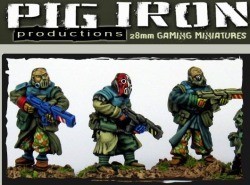 As I pointed out in the previous Pig Iron Productions review too, they do state this at their website and make it perfectly clear that they don't come with bases tho. Scale-wise these guys look a little small next to Space Marines. Taking into account that these figures aren't wearing Power Armor either, I'd have to say that the scale is probably right about 28mm as advertised. 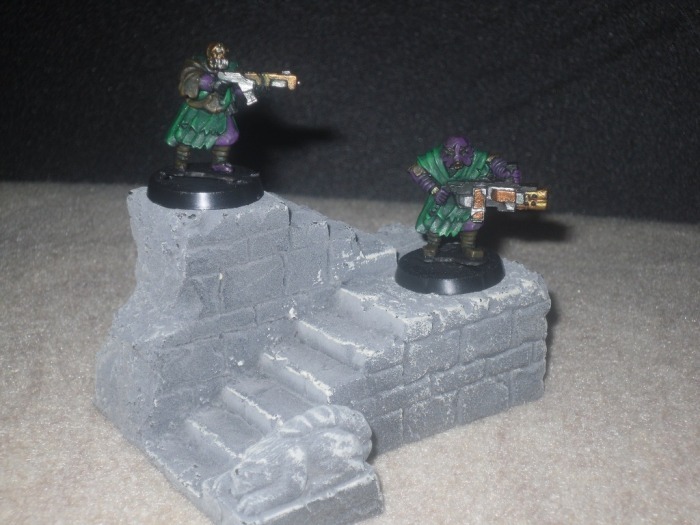 Once again the Pig Iron Productions crew have come through with two more fantastic assortments of sci-fi miniatures, which can be used in most any sci-fi skirmish game. I reported last time that their sets run about $17 USD after the conversion from British Pounds. 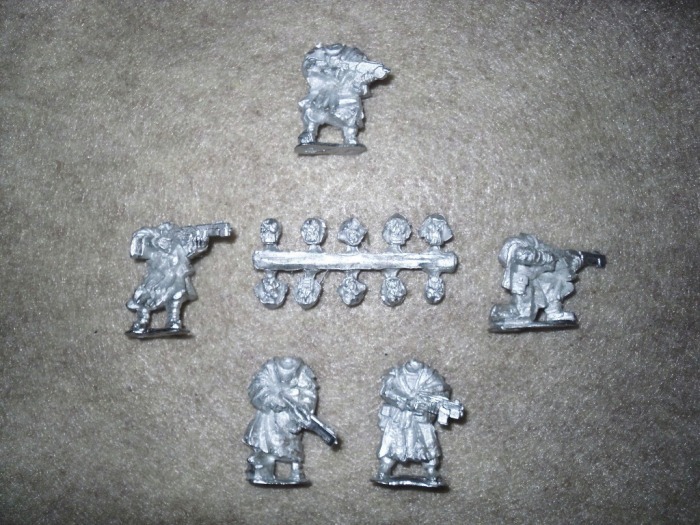 Well, I did some digging around again before putting this piece together, and I found that TheWarstore carries Pig Iron Productions stuff here in North America, and they run $14.99 per set there, which is even less than I initially said. 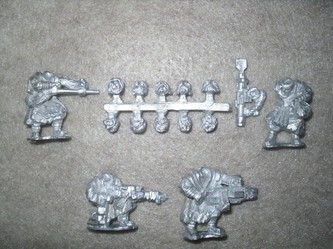 At $15 a set these are some of the most affordable all metal pieces out there in 28mm scale, best of all they look great too. 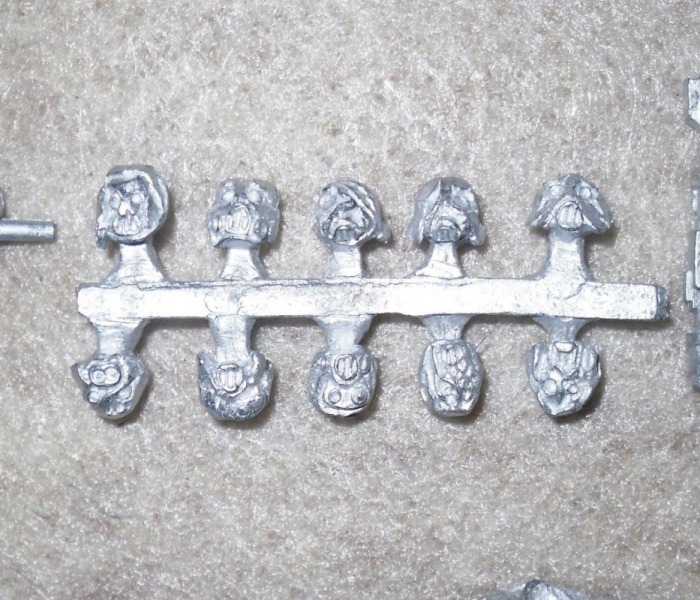 They really do have some talented sculptors, and their pieces seam to be only generic in the sense, that they could fill the role of multiple different army pieces at a glance, but in terms of the sculpting quality there's nothing generic at all about them. That I think is their biggest strength, aside from the price-point they manage to sell their figures at. Now if only they could start to include some flat 25mm round bases with their stuff.